New User? Sign Up! forgot password? Signing Savvy is a sign language dictionary containing several thousand high resolution videos of American Sign Language (ASL) signs, fingerspelled words, and other common signs used within the United States and Canada. FINGERSPELLING……that dirty BIG four-teen letter word! In all my years of signing, I have never had anyone say to me, "I can’t believe how easy fingerspelling is!" or "Man, I really LOVE fingerspelling all these odd words that don’t have signs for them." It just isn’t a favorite part of the job! It is the thing that makes even seasoned interpreters break into a sweat when they have to start signing for a calculus class or in a court of law with a bunch of foreign names flying through the air. I have come up with a few tricks through the years to make it easier, but the only true way to improve your fingerspelling skills is to practice. The practice needs to be both receptive and expressive. Expressive - When you are signing/fingerspelling something to someone else. There are some good websites out there that offer some examples to get that receptive practice. (See our Facebook page for one sited there.) I also want to take this opportunity to show you a few ways Signing Savvy can help you with your fingerspelling. Although we have many savvy users of the site, it can be easy to overlook features if you have not used them before. First, Signing Savvy shows a fingerspelled version of every word. When viewing a sign video, the squares next to the word indicate the different versions of the sign that exist and there is always a "FS" version, which lets you see the word fingerspelled. It is a good reference, however, you will notice that the "FS" version individually signs each letter and does not demonstrate the flow between the letters. 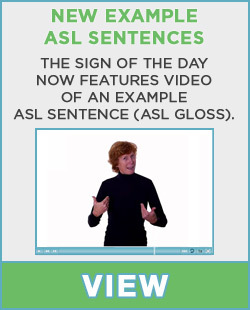 (Note: There are some words that should always be fingerspelled and the main video is of the word being fingerspelled - see ASL as an example and notice the flow between letters). You will notice that underneath the video it tells you what is currently being signed, including the current letter being signed when fingerspelling a whole word. Second, if you are a Signing Savvy Full Member you can use the Signing Savvy flashcards and quizzes to test yourself on fingerspelled words by creating a wordlist of only fingerspelled versions of words. If you want to add a word that has multiple signed versions to your wordlist, just make sure you are viewing the "FS" or fingerspelled version before adding it to your wordlist. Once you have all the words you want in your wordlist, use either the flashcard or quizzing feature in Signing Savvy to test yourself. Fingerspelling while in the car. Several people suggested the trick of fingerspelling while in the car (license plates, road signs, building names etc….). I like that idea but I just hope you are the passenger in the car at the time so that you aren’t having to fingerspell the license plate of the car you rear-end because you are too focused on spelling the LONG name on the building you are passing! If you are on a longer road trip, you could also play the "alphabet game" where you look for words (on signs, billboards, buildings, cars, etc.) that start with each letter of the alphabet, starting with A. You compete with others in the car by trying to be the first to get to Z. Each word you see, you would point at it and then fingerspell it. An alternate version would be to look for any item, not just words. Of course, again, this game is not recommended for the driver. Focus on the whole word and not letter by letter. Don’t get fixated on each letter. Don’t get fixated on each letter, rather focus on the entire word and the flow of the hand changing as you create the word in the air. This will also help in not allowing you to “throw your letters”, which is another common problem for new finger spellers. "Throwing your letters" - This is something that many new signers do and it is a bouncing movement either up and down or forward that is disruptive and bothers with the reading of the fingerspelling. The elbow should stay still and just have the fingers moving and the wrist when appropriate. We also need to remember the general rules for fingerspelling. It isn’t right to makeup signs for words you don’t know because they are too long to fingerspell. You may laugh, but I see it happen all the time! Some people have even used the excuse that they work with young children so they can’t fingerspell. That is NOT true. When young children are fingerspelled to for small words that normally can be fingerspelled, they focus on the shape of the word. They will copy the shape to the best of their ability and then later they will make the connection to the alphabet. I have seen little children who are too young to know better, spelling words like BUS and BUG and are not even aware that they are spelling things. I invite everyone to join us on our Facebook page where we have regular discussions and questions going back and forth about the hot topics in sign language and Deaf Education. It is just another great resource offered to you by Signing Savvy! You must be a member or registered guest to add comments. If you already are, please login. If not, become a member now. One thing that many new signers struggle with is how to show tense (past, present and future) while signing. In ASL, you don't sign words like went or going or suffixes like "ing", "ed" or "s". By including the sign NOW at the beginning of a sentence, you can clarify the sentence is in the present tense. English Version: I am going to the store. ASL Version: NOW + STORE + I + GO. By including the sign PAST or BEFORE (the open hand waves back over the shoulder in a single motion) at the beginning of a sentence, you can change the meaning of the sentence from present to past. English Version: I went to the store. Alternatively, you can make the sentence show past tense by adding the sign FINISH to the end OR the beginning of the sentences. You can make the sentence show future tense by adding the sign NEXT to the beginning of the sentences. English Version: I will go to the store. The time of the day that the signer is signing the phrase can effect how the sentence is interpreted, even though the words/signs are exactly the same. For example, if the sentence below was signed in the morning, the interpretation would be as shown: "Tonight, I will eat dinner." English Version: Tonight, I will eat dinner. But if the same sentence was signed late in the evening, its' interpretation would be: "Tonight, I ate dinner". English Version: Tonight, I ate dinner. As you can see, communicating tense can be a tricky thing sometimes. My recommendation is to pay attention to how others sign tenses and consciously practice it as you sign. One of the most common questions I get from people who are first learning sign language is, "How do you remember so many new words? It's overwhelming!" It is; and unless you plan on incorporating it into your everyday life, it won't stick with you. Often sign language instructors will divide sign vocabulary up into categories like household items, food, family, colors, shapes etc... Doing this helps you to categorize the words and file them into your memory bank that way. As you are using Signing Savvy to learn, create your own word lists to categorize the signs you are learning or look into the many, many shared word lists that others have already created. This categorization of vocabulary will be very helpful to you in your learning. Also, start with the words that are a part of your everyday life, the words with which you will have constant interaction. Then using the printing feature from Signing Savvy, print out little cheat sheet photos that you can place around the house on those everyday items. You will be surprised how quickly you will memorize the signs for these words. Then later, because you have already created the word lists, you will be able to give yourself a quiz online to be able to sharpen those skills even more. If you have others that live with you, see if they will help you practice both your receptive (you receiving the sign from others) and expressive skills (you signing the words to others). It is this constant interaction that will improve your learning experience. im pretty young and got interested in sign language and the other websites just would'nt do it then i got on signing savvy and i LOVE it! its AWESOME! i couldnt learn better with any website! You may have noticed a theme across the signs of the day in the last week. We asked our Twitter followers for suggestions for the sign of the day and someone suggested we try week-long themes. Although we will not be using a theme every week for the sign of the day, we thought it was a great idea to start incorporating a theme occasionally. We choose family members for our first sign of the day theme, from Wednesday, September 14 to Wednesday, September 21. Signing Savvy Member Tip: To see past sign of the days, view the sign of the day wordlist. If you follow the sign of the day, we thought it would be a great learning opportunity to point out a few takeaways about the signs from the last week. Sunday's sign of the day was MOM. For this sign, the thumb of the 5-hand taps the chin. Signing Savvy Member Tip: Take a look at the memory aid for signs to have a better understanding of the origin of signs and a way to remember them. Our memory aid for MOM explains that the lower portion of the face refers to the female gender and that's one way you can remember the sign for MOM is signed on/near your chin. If you look at the sign for FEMALE, you will see you stroke the side of your chin with the thumb of the A-hand. DAD, which was the sign of the day on Monday, has some similar signing patterns as MOM. DAD is signed on/near the forehead and male signs are typically made on the forehead. See the sign for MALE and DAD. GRANDMA (the first Wednesday's sign of the day) and GRANDPA are signed similarly to MOM and DAD, but with an additional movement out suggesting a generation out. The signs for UNCLE (Thursday's sign of the day) and AUNT also follow these same gender patterns with UNCLE signed with the U-hand in a circular motion near the forehead and AUNT signed with the A-hand in a circular motion near the chin. You can easily remember the hand shape that each of these signs use because UNCLE starts with the letter "U" and uses the U-hand and AUNT starts with the letter "A" and uses the A-hand. Now that you are starting to notice the patterns of signs, you should be able to guess the sign for NIECE (the second Wednesday's sign of the day) and NEPHEW. Both start with the letter "N" and use the N-hand in a circular motion. NIECE is signed near the chin, while NEPHEW is signed near the forehead. COUSIN (Saturday's sign of the day) is signed using the C-hand in a circular motion close to the head -- that sign could be used for a female or a male cousin. There is also a second way to sign COUSIN where you shake your C-hand by the head instead of using a circular motion. If you wanted to specifically sign FEMALE COUSIN, do the sign by your chin, and if you want to sign MALE COUSIN, do the sign by your forehead. The signs for SON (Tuesday's sign of the day) and DAUGHTER (Friday's sign of the day) do not follow the exact same sign pattern as the last few signs discussed. SON and DAUGHTER start like the signs for MALE and FEMALE and then transition into the sign for BABY. You can remember these signs because (regardless of age) a SON is one's MALE BABY and a DAUGHTER is someone's FEMALE BABY. Our featured sign of the day theme of family members did not include any signs for in-laws, but there is also a pattern to be found when signing in-laws. Often it is the sign of the family member, plus the sign for LAW. See MOTHER-IN-LAW as an example. We hope you enjoyed our first week of using a theme for the sign of the day! We will also be using a theme for the next week. We had a Twitter follower suggest the theme of emotions. Thursday, September 22 - Thursday, September 29 will be emotions - we hope that makes you "happy"!! Question: I am looking for the sign for word (insert word) and cannot find it. Answer: There is not a sign for every word in the English dictionary. However, there is usually a sign for most concepts expressed in English. Conceptually correctness is the key. If you are trying to find a sign on Signing Savvy, first think about the meaning behind what you want to say. If you search for a word and either no sign comes up or the sign that comes up seems to have a different meaning than what you want to say, think of a different word that conveys the meaning of what you want to say and search for that word. I want to look up the word PROTECTION from the following sentence: I need to put on some more sun protection before going on the boat. When I search for PROTECTION, I do not find a sign. Therefore, I simplify the word and search for PROTECT. Simplifying the word is a good searching strategy on Signing Savvy, such as removing the -ion, -ing, or s (plural form) of the word. However, in this case the sign for PROTECT may not really convey the conceptual meaning of sun protection. That sign could be used but what I'm really trying to say in my sentence is more like the sign for FILTER or SCREEN. Now while looking this up I also thought of the work block, as in sun block. When I looked up BLOCK, I found two signs, one for the meaning to block something or prevent it from entering, and one like a building block. The sun protection I was thinking about was more of a filter than a block, since I still wanted to get a tan, so I would use the sign for FILTER. As a signer and a sign language interpreter, you constantly have to decide which sign best fits the conceptual meaning of what you are saying. This is one thing that beginner signers really struggle with. It is not always a direct English to ASL sign translation.